National dialogue is an increasingly popular tool for conflict resolution and political transformation. Normally, it can broaden debate regarding a country’s trajectory beyond the usual elite decision makers. The political events that took place recently have caused a lot of confusion, chaos and violent incidents across the country, painting a bad picture about the country and negatively affecting the national development programmes and the country’s way forward in terms of international engagements and trade. To maximise on the dialogue’s potential to address the real drivers of conflict, it is imperative that all key interest groups be invited to participate, including opposition political outfits and other traditionally excluded groups like church representatives. Following the violent incidents that took place in most parts of the country last month, President Mnangagwa sincerely invited all political party leaders to attend the national dialogue at State House. As a listening leader, President Mnangagwa has always been calling individuals, groups or organisations with constructive ideas and suggestions for nation building to present them to him. His word has always been that his doors are open for dialogue. Some political party leaders decided not to be part of the national dialogue by setting pre-conditions before the discourse. This did not deter President Mnangagwa from meeting with other willing political party leaders. It is essential for political party leaders to put their political jackets aside and converge on ideas which bring forth lasting solutions to resolve the political conflicts existing in the political landscape of Zimbabwe, and indeed save the nation from further turmoil. Usually, a national dialogue seeks to reach agreement on key issues facing a country. The fact that a national dialogue has been called for means that there is a problem and consequently need for discussions so as to come up with lasting solutions to the economic and political challenges bedevilling the nation. It’s unfortunate that there has been a blame game by the opposition parties in terms of the violent protests and looting of goods in shops that took place between January 14 and 16 2019. The MDC-Alliance leader, Nelson Chamisa, denied that the people who participated in the violent incidents and looting were his supporters. However, contrary to that, his Chitungwiza legislator Godfrey Sithole was captured inciting MDC-T supporters to take part in violent activities and looting of commodities in shops during the national stayaway. It is worth to note that national dialogue is an inclusive process and is secondary to the good faith of participants honestly trying to understand the perspectives of people with whom they may disagree, but without giving up commitment to the truth. Thus, good faith is a prerequisite to a fruitful dialogue. As such, political party leaders participating in the national dialogue should be earnest and sincere when giving their contributions. National dialogue is not unique to Zimbabwe. In response to a tense and deteriorating situation in 2003 to 2004, talks were organised in Mauritania. The national dialogue took place under the support of UNDP. It brought together about 400 members of Mauritania’s government, opposition and civil society members over a period of six months. In view of that, an entry point for the dialogue was to advance the Millennium Development Goals (MDGs) to end problems such as poverty, illiteracy and HIV/AIDS by 2015. Therefore, leaders of political parties, churches and civil society organisations should join hands and effectively participate in the national dialogue for the betterment of Zimbabwean citizens. The resolve by President Mnangagwa for all political parties in the country to group and come up with a framework for national dialogue should eventually unite political parties towards the agenda of national building. Zimbabwe has been facing challenges emanating from political differences, especially after elections, and during the recent stayaway, which resulted in loss of human life and property worth millions of dollars as well as further drifting the country away from path of international re-engagement. All political parties that fielded candidates in the July 30, 2018 harmonised elections have come to the realisation that they all belong to one Zimbabwe, hence they have begun the process of dialogue to ensure that the country moves forward regardless of political differences. Dialogue not only requires political parties, but also requires all other stakeholders, be it from civil society groups or the church, to be active in contributing towards issues that they see pertinent in addressing the progression of the Zimbabwe’s economy. 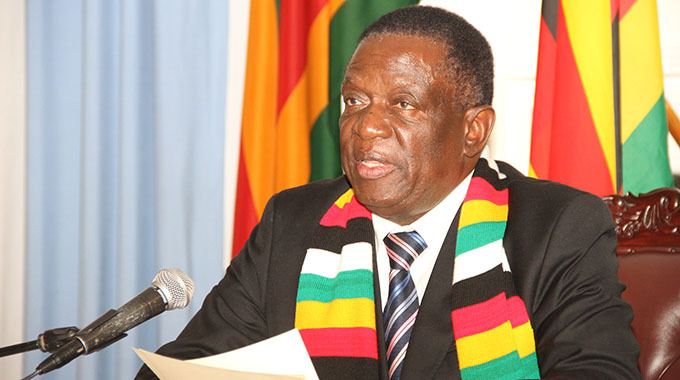 Explaining the positivity of the national dialogue at the State House during a meeting to come up with a framework for the national dialogue, The Herald on February 7, 2019, stated that President Mnangagwa mentioned that Zimbabweans owed it to themselves to raise their country higher up the pecking order of nations. The President emphasised that outsiders should only come in to assist Zimbabwe, but the major accountability for the country’s advancement remained with Zimbabweans, and that the national dialogue must encompass the meaning of sovereignty, which is being responsible for the success of our country without external influence. As clearly spelt out by the President, true peace should never be imposed from outside, but it should come from within our own society, and it should be nurtured by Zimbabweans through the national dialogue which they would have taken part in through honesty and mutual respect. Zimbabwe heavily depends on the success of the national dialogue to ensure it comes up with home-grown solutions that have the interests of Zimbabweans at heart. The President at State House also noted that his hopes were in the inaugural dialogue by all political parties to provide a firm foundation upon which Zimbabweans together and without unwarranted foreign interference, would build the Zimbabwe they all want. Various positive sentiments on the same dialogue have been expressed on social media. On his Twitter handle, the Deputy Minister of Information, Publicity and Broadcasting Services, Energy Mutodi, said that the dialogue on cards should reveal clearly those who are in support and expose those who are not in support of it and would want to remain benefiting from the chaos and fighting. The deputy minister emphasised that calls for conducting a national dialogue by President Mnangagwa had shown political maturity and true statesmanship. The snubbing of the national dialogue by MDC-Alliance leader Nelson Chamisa recently exposed him as a political novice. An MDC-T official on their Twitter handle tweeted a message congratulating #Team Zimbabwe for taking necessary steps to rebuild Zimbabwe in their diversity. It also urged politicians to put their political jackets aside and converge on ideas which should bring forth lasting solutions to resolve the challenges in Zimbabwe. We will indeed save Zimbabwe from doom, the message also read.